Drones may turn out to be quite a useful weapon against pork barrel funds, including those retained in the P3.7-trillion budget for 2019. Sen. Panfilo Lacson hinted at this as he said “life goes on” after both houses of Congress ratified the P3.7-trillion 2019 budget that he said is laden with pork. Lacson also said he is eyeing more headway against “pork” and other flaws in the warped budgeting process that has allowed it to thrive. 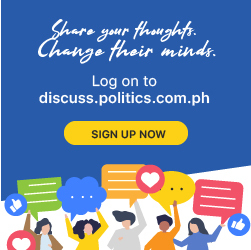 He said making sure the budgeting process is followed properly will prevent “pork” by having district representatives in Congress take part in planning at the local level, instead of inserting projects after Malacanang has already submitted its version of the budget – the National Expenditure Program – to Congress. Yet, the drone flights of some of these projects showed a physical accomplishment ranging from zero to one percent. Also, Lacson questioned billions of pesos in “pork” projects in the 2019 budget, including at least P160 million for each House member. While these amounts were retained in the 2019 budget, Lacson noted some “progress” against pork had been made, including the deletion of all appropriations for flood control, particularly dredging, desilting and the like; and realigned to capital outlay for the purchase of dredging machines.